My personal opinion was that a chance to return to life in the wild (with all its uncertainties) was very much the right ethical choice over a life as an entertainer and breeder at Loro Parque. It may be better than life as a solitary whale. It might also prove to be worse if one or the other whale assumes the role of punching bag, as happens in so many of these moves. Winnie at Sea World of Florida was a great example of a move that was a sad and dismal failure. Winnie was routinely beat up and terrorized so badly after she was deposited by aircraft in Orlando that she was eventually moved to Sea World of Ohio for her safety. Tilikum is also an example of an animal that is (or at least was) constantly raked, bitten, chased and otherwise brutalized by the smaller, more agile and dominant females. Things look pretty peachy in the above pictures, but my experience is that initial introductions tend to eventually morph into something a little uglier. At least now she’s in another acoustically dead concrete cage. Fair and good points. Important to keep an eye on how things develop. Very hard to say whether solitary confinement is better or worse than GenPop. Tekoa may have a view. But that fish tank at Harderwijk sure looked horrific. A picture does not show or reveal anything that happens in 24 hours everyday. To me both pictures are wrong. I think that when they let her meet the other orcas they leave both very very hungry so when they meet they are more focused on the food than on each other…i think they use the same tricks as you would train a dog! I thank you for following this subject and i truly hope that as a journalist you can involve more and more people, especially here on USA. Very little media is having this subject covered. I truly hope that an appeal will be made and that Eu government will get involved. At least you look at it in a new light. Morgan is getting along with the others. Thanks man you made my day. I am really glad that you are continuing talking about Morgan. I really hope that the judges decision to move her can be reversed. Even though she is now in a bigger acoustical prison, with forced upon her companions, she still does not have the freedom for her (and the others) calls to not echo off the walls and she does not have the freedom to be with her family. Why wasnt morgan put in quarantine upon arrival at Loro Parque? Every animal that is moved from one place to another is placed in quarantine. Loro put the animals together straight away. First Adan, then Skyla. Very unusual and unresponsible – and dangerous of Loro. Mr Zimmerman I have a lot of respect for you and what you write but why didnt you mention Sto in this piece as another option? The photos you use make it look like everything is great for Morgan, anyone who knows anything about animal behavior knows that initial contact means nothing, animals need to be familiar with their environment, familiar with new additions to that environment before you know how they are going to get along with each other. 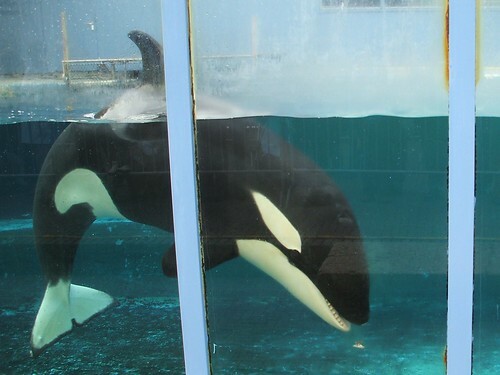 I really do hope for Morgans sake and the other orcas there that they do get along, would hate to see another Tekoa! Personally I think every facility that houses wild animals should be forced to have CCTV 24/7 running so the world can see what really goes on and not just the photos that they themselves decided to release. I think a number of commenters have misunderstood me with regard to this post. I am in no way saying that I think a life at Loro Parque is preferable to a chance at life in the wild, and said clearly that I believe Morgan should have been released back into the wild. But I am saying that, at least so far, a life at Loro Parque is better than a life in solitary confinement in a tiny tank at Harderwijk. That is all I am saying. No more, no less. It will take a while for Morgan to be fully integrated into the Loro Parque group and only in time are we going to see where she falls in the social ladder and how tolerant/intolerant others are of her and she is of others. The only thing Tim is saying is that at least by everything we have seen about the introductions between Skyla, Kohana, and Morgan are not starting off badly which is better than initial hostilities. I do agree however that these rapid introductions of Morgan to their other animals, especially after coming from that fishbowl at Harderwijk and their dolphin herpes, seems very unprofessional and rash of Loro Parque. They really don’t care about people opposed to captivity making an issue of things so why not keep Morgan away from the others for at least a few days and monitor her and give her a full veterinary review? Morgan was with Adan around 24 hours of being there. We all know the situation at Loro is no better than it was, and that Morgan will eventually be bred to freshen up the gene pool a little, and probably as soon as she can. Kohana is a good example of that with how young she was allowed to breed and then get pregnant again so soon. Unless Kohana or Skyla figure things out Morgan won’t have a very good education on what to do when the same starts to happen to her. Things aren’t peachy but I think we agree that, at least for the moment, Morgan is in a better place than she was. From a prison cell to a prison yard is hardly an improvement. Especially as she is now exposed to this dysfunctional, unstable group of animals who are likely to beat up on her. An unusually irresponsible piece from you, Mr Zimmermann. Tsk. I can´t remember that I´ve given an allowance to you to use my photos. But however – to show Morgan´s new place it is ok.
Well, I am the one who made these photos and not only these. They were made on December 1st at 12:21 and 12:31 local time. That day I stayed in Orca Ocean (Loro Parque) backstage from about 08:30 and could observe all things happening there as I could do the days before and after. You may believe or not – all the animals there including Morgan and Skyla have been feeded as usually. No idea to starve them, not this day and not any other day. This method may have been used years ago by some trainers but I can assure that this is definitively not the way as the trainers in Loro Parque work. It is a shame that “Freemorgan” writes here “they definitively starved both whales and then put them togeher, its pretry clear by looking at the pics” ! Everybody is free to have his own meaning about this theme of Morgan but it should be serious and not telling lies. Just to mention it – I am not an employee of Loro Parque and the photos I make for them I make for free due to private reasons. So noone can say that I depend of Loro Parque´s payments or any other nonsense.